2.7 Summarize methods and data related to mobile device synchronization. Welcome to ExamNotes by CertBlaster! In this section we will look at the ways we manage data to prevent loss in the mobile environment. In particular we will look at the ways to synchronize (sync) your selected content with your PC or in the cloud. We will look at the types of data typically involved in a sync by category and application. Then we will look at the methods used and how your authentication credentials are common among your services. Often specialized software or encrypted connections may be required, so these too will be covered. As you will see in the text that follows. 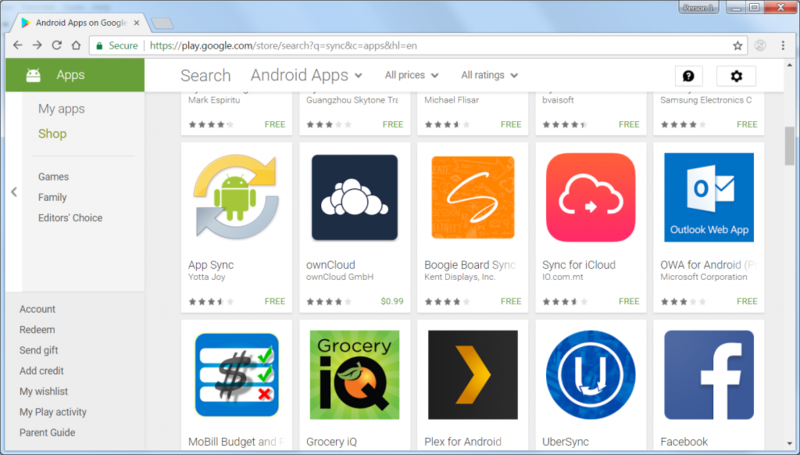 Here is a look at some free sync apps available for android in Google Play. The sync process, creating a second copy of the selected content in another location, is a real logistical time saver as well as a good loss prevention technique for your data. Whether you are syncing with a local computer or a network or cloud based location the data classifications and programs used will usually be the same. We will look at the data types first. Your contact list or address book is a great way to retain information about those you interact with. The information is only useful if it is accessible. Optimally you would want any mobile contacts to be available on your home or office PC or vice versa. This is accomplished by synching importing or exporting information to suit your needs. Email is illustrative of one of the earliest use of contact lists and the need to retain data and make it accessible. Your email client may include contacts or address books, reminders, and of course the emails themselves. You can choose to sync any or all of these. Pictures can be synced between devices and the internet. While technically a backup, using a shared internet location like iCloud Drive or Google Drive able to sync easily. The online presence of your data is the key to unifying the content across devices. These can also be synched and shared using the same tools described above. It is simply a matter of selecting or deselecting them as desired. It is important that you are clear in the settings about how you want the sync to handle duplicate content. You don’t want to lose anything, but you also do not want multiple copies of the same content. Your email client will typically include a calendar you can choose to sync any or all of it. Location data is used, most importantly by emergency services. When you make a VoIP or cellular call to 911 your location information is shared whether you have the feature enabled or not. Also if enabled the location data synced to the cloud for example, can be used to find lost mobile devices. Depending on the App you can cause the device to ring or emit a tone, show current or last location on a map and activate the camera to see potential information about the people or places in sight. Social media has the ability to sync a great deal of your data. Make sure your sync’d data is encrypted and protected. These can be synced individually or by keeping your collection in sync. This is OS dependent for the program and settings. You will generally be able to sync one, selected or all of your collection. There are two main ways to sync data. To Synchronize to the Cloud is to synch your selected data to the Cloud. Naturally you need an internet connection to accomplish this type of sync. This would include free, limited or subscription Cloud services, including iTunes, iCloud, Google Drive, Dropbox, OneDrive and others. If you are using a proprietary synchronization method be aware that it may only sync the proprietary data or specially configured data. For example a Dropbox sync requires the data to be synced to be uploaded first to the Dropbox folder online, after which it will be synched. In the case of iOS products only some of the content can be synced, like purchased content. Synchronizing to the Desktop is quite common and in many cases is accomplished through a physical connection between the mobile device and the desktop. However the sync can be configured across all configured devices as you will see. 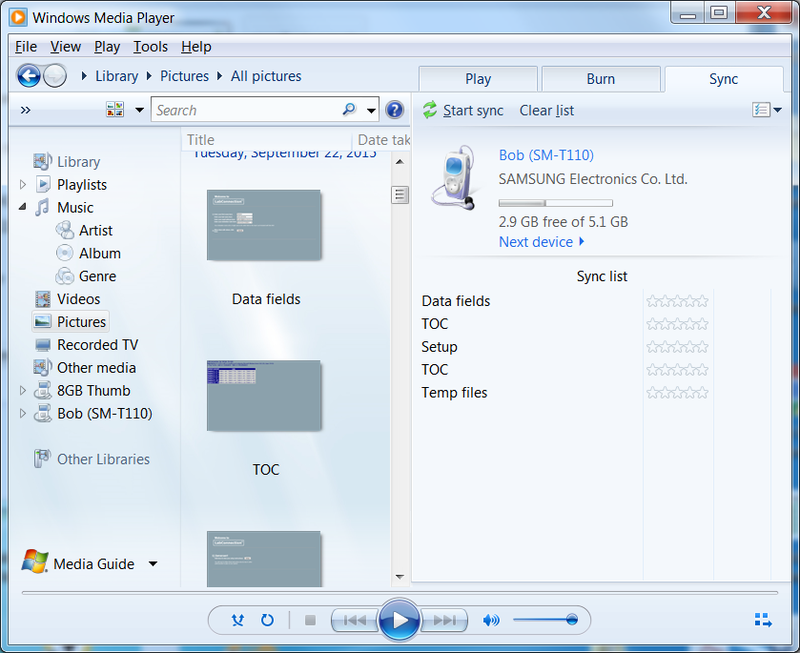 Here we use Windows Media player to sync images with the desktop and Android device. This could be abbreviated to Trust, a client or clients must authenticate with the server or servers and vice versa before any actual data is exchanged in either direction. Communication only takes place after both parties are satisfied that the other party is authentic. If there is a problem there will be no connection or in a browser it will be accompanied by a red padlock as opposed to the green that indicates that the connection is secure. This type of authentication allows users to access authorized content or services from the desktop or mobile platforms. In some cases the connection is allowed and the access is reported to the primary account holder. Reviewing Software requirements to install the application on the PC would indicate that the hardware connectivity requirements have been met. After that the ability to download and install applications to the PC is what you would expect. Now, the application and app are different but are usually designed to install correctly on mobile or desktop devices when correctly chosen. Connection types to enable synchronization are basically going to be high speed and reliable. This would include your home 802.11 Wi-Fi connection or the very common USB or FireWire options. These offer the two-way transmission of data over secure connections. This security and reliability are crucial to synchronization. For example however good your cellular provider is, there is no continuity guarantee associated with synchronization and your data limits or a connectivity issue could cause a sync to fail. These are less likely in Wi-Fi or direct cable connections. That’s all for Objective 2.7 and with that Main Domain 2.0 “Other Operating Systems and Technologies”. Good luck on the test! If you are following these posts you are getting stronger every day.